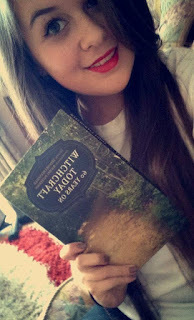 If you are going to be out and about celebrating the Summer Solstice today, why not take the opportunity to enter the Moon Books selfie competition? All you need to do is take a photo of yourself holding something published by Moon Books and post it to via Twitter or Facebook with the tag ‪#‎moonbookselfie‬. Obviously you do need to have, borrow or buy a book published by Moon Books to hold in the photo, but I'm guessing quite a few Bad Witch's Blog readers might have copies. The rules don't specifically state it has to be a dead tree format book in the photo, so holding up your Kindle showing the ebook cover of a Moon Book title would probably do as well. There are prizes of paperbacks for the best entries and the closing date is the end of June 2015. Moon Books has published some wonderful pagan titles, including Grimoire of a Kitchen Witch, Journey to the Dark Goddess and Witchcraft Today - 60 Years On, which you can see in the picture to the right (albeit strangely reversed for some reason). So, why not pop a Moon Book book in your bag today along with your phone or camera and get snapping? Visit Moon Books' Facebook page to find out more details about the competition: https://www.facebook.com/MoonBooks?